I went to my first Knicks game of the season, thanks to a generous friend of The Doe Fund who offered up four seats in the first section above courtside. The Knicks looked ugly in the first half: no ball movement, settling for way too many long-distance jumpers, and barely playing one end of the floor. Then suddenly they transformed into another team in the second half, particularly in the fourth quarter, clawing their way out of misery. Basketball is such a rhythmic sport. Also, a rookie began to blossom in the second half. 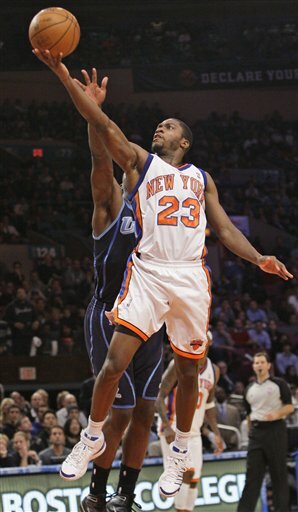 Toney Douglas - from Florida State. I heard quite a bit about him when he made a splash in the ACC, the same conference that BC plays in. Despite a loss that came down to the final shot, I liked two things that I saw tonight: big time effort in the fourth quarter and a rookie who's willing and able to take big shots down the stretch.